The petition of the 16 villagers alleges that the entire land acquisition process is “marked by illegalities and irregularities”. 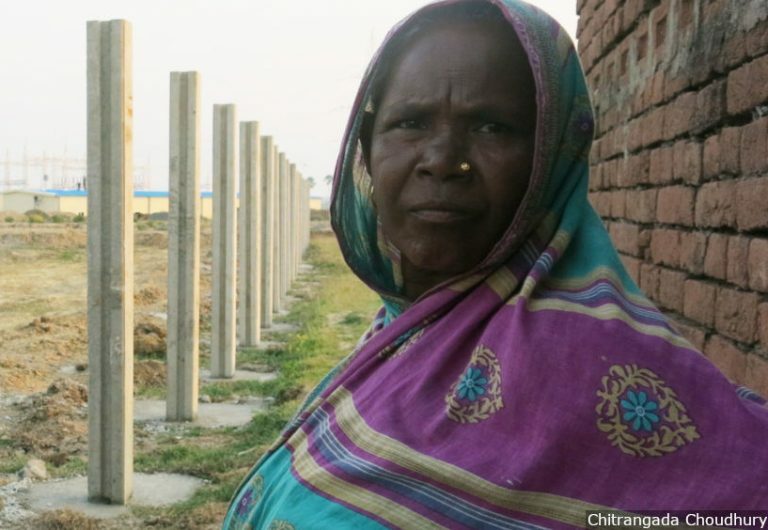 The ongoing land acquisition and the latest legal challenge to it from locals is important to Jharkhand--one of India’s poorest states--and the rest of India, because it is the first time the state government has invoked a landmark 2013 land acquisition law for private industry. Meanwhile, Ramamurthi Sreedhar, a scientist from Environics Trust, a Delhi-based nonprofit, has moved the National Green Tribunal (NGT), challenging environmental clearance to the Adani Group’s thermal power project coming up on this land. The petition cites numerous grounds, including the company switching the water source for the plant from the Chir river to the Ganga river, post-clearance. Godda Deputy Commissioner Kiran Kumari Pasi, whose office is acquiring the land, did not respond to calls and a text message from IndiaSpend on February 11, 2019, seeking the administration’s response to the villagers’ case in the High Court. Adani Group representatives had not responded to an email from IndiaSpend, sent on February 11, 2019, seeking comment on the legal challenges to the land acquisition and to the environmental clearance. This story will be updated with their responses, if either of them gets back. In May 2016, the Adani Group, led by Gautam Adani, one of India’s richest and most powerful men, asked the Jharkhand government to acquire close to 2,000 acres of land--95 times larger than Mumbai’s downtown Nariman Point business district--in 10 Godda villages to build a 1,600-megawatt power plant fired by imported coal. The Adani Group will sell the power generated in Godda to Bangladesh. In March 2017, the government said it would acquire 917 acres in six villages: Mali, Motia, Gangta, Patwa, Sondiha and Gaighat. So far, the government has acquired over 500 acres of private land in four--Mali, Motia, Gangta and Patwa--home to the 16 petitioners. The Jharkhand government has undercut several safeguards in a landmark new law, the Right to Fair Compensation and Transparency in Land Acquisition, Rehabilitation and Resettlement Act (the LARR Act of 2013), to acquire land from unwilling villagers for the Adani Group, according to a December 1, 2018 IndiaSpend investigation. The legal safeguards undermined relate to ‘public purpose’ reasoning, social impact assessment, consent and compensation. The safeguards were introduced to end India’s century-old legacy of violent land acquisition, replacing it with a “humane, transparent and participative” process. Instead, in Godda, as several villagers told IndiaSpend, sustained protests and pleas, and even gram sabha (village council) resolutions passed against the land acquisition, have been ignored by authorities since 2016. On August 31, 2018, as local police watched, women farmers from the Santal tribe fell at the feet of Adani personnel, begging them to not seize their land. IndiaSpend reported how criminal cases were filed against some Adivasi and Dalit farmers who protested the takeover of their ancestral farms. The 16 villagers who have now moved the High Court are from Santal Adivasi, Dalit and other backward caste communities and include retired teachers, farmers, sharecroppers and agricultural workers. The petitioners said that they and other affected villagers had written "several letters to different authorities highlighting the illegalities in acquisition of land and protesting against the acquisition of land, but not a single response/reply was received." Aggrieved, they were approaching the court. The petitioners include Suryanarayan Hembrom, a Santali farmer from Gangta. After Hembrom and other villagers protested the forcible acquisition of their land in July 2018, Adani Group personnel filed criminal cases--including charges of rioting, criminal trespassing, and breaking public peace--against them. Suryanarayan Hembrom and other farmers are facing criminal cases for resisting the acquisition of their land. Hembrom is one of the petitioners who has moved the High Court. The state government is acquiring land from farmers for the Adani Group, calling it ‘a public purpose’ project, but this categorisation is flawed. Since the group will sell the entire power generated in Godda to Bangladesh, the land acquisition is for the private gain of the Adani Group. The Social Impact Assessment (SIA), meant to assess the costs and benefits of land acquisition was “fundamentally flawed”. These errors include underreporting the number of affected people, “wrongly claiming” that there will be no displacement, not analysing costs to the villagers, such as the loss of land and farming livelihoods and community assets in the villages, including grazing grounds and water bodies, and excluding the views of villagers who have raised critical questions about the land acquisition project. While the SIA is meant to be carried out by an independent agency, a Mumbai-based consulting firm, AFC India Limited which was given this task, did not undertake detailed site visits and meetings with affected people to prepare the SIA, and acted in a manner that seemed to support the company. The public hearings held in 2016 for the project were not “free and fair”. Several villagers were barred from attending it and lathi-charged by the police. Documents and notifications around the various acquisition processes and safeguards have not been publicly disclosed, and made available to affected people, as the government is required to do under the law. The consent of 80% of the landholders has not been taken, as it should have under the LARR Act. The petition annexes representations by 400 landowners opposing the land acquisition; these representations were submitted to the state government and the Jharkhand Governor in 2017. The state government has acquired community land of the villages for the Adani Group “without the consent” of the gram sabha. The acquisition “violates” safeguards in the Santal Parghana Tenancy Act--a 1949 law, intended to prevent Adivasi dispossession by placing several restrictions on the transfer of land from farmers. Last October, Sumitra Devi, a Dalit farmer in Motia village, had broken down while telling IndiaSpend that her land was in the possession of the Adani Group, after the government forcibly acquired it in February 2018. Days after giving the interview, she died. Her husband Ramjeevan Paswan is now among the petitioners. Days after being interviewed about how her land was forcibly acquired, Dalit farmer Sumitra Devi passed away. Her husband Ramjeevan Paswan is now among the petitioners. The petitioners are asking the court to quash the acquisition of agricultural and common property land, and order the return of land acquired so far to its peasant owners, for many of whom land is the sole source of livelihood. They are also seeking interim relief of a stay on all construction activity, currently underway on the land, by the Adani Group. “The company should have directly approached villagers, and they would have decided if they want to sell their land,” said Sonal Tiwary, a Ranchi-based lawyer with Human Rights Law Network, representing the villagers. Tiwary said that the government had “misused” the 2013 law to benefit the Adani Group. Meanwhile, in a petition filed on February 6, 2019, in the NGT, scientist Sreedhar, as we said, has challenged the environmental clearance awarded to the power plant in August 2017 by the ministry of environment, forests & climate change. The Adani Group secured environmental clearance for the project citing Godda’s Chir river as the water source for the plant’s annual requirement of 36 million cubic metres. It now says it will draw water instead from the Ganga river in adjoining Sahibganj district. It also wants sub-surface rights to over 460 acres of land for a 92-km water pipeline. The petition argued that the company gave “wrong data” to show that there is “adequate water” in Godda’s Chir river, in order to secure “speedy approval” for the project, and regulators failed in their duty to analyse and verify claims made in the project’s EIA report. The environmental clearance granted should be rejected, as per provision 8.1.vi of the ministry’s Environmental Impact Assessment rules, which deals with concealment and submission of false or misleading data, said the petition. The petition also puts forward other grounds to challenge the project, including the violation of the government’s own guidelines for locating thermal power plants; these state that no prime agricultural land shall be converted into an industrial site. In Godda, the plant is coming up on fertile, irrigated, multi-crop lands, and 97% of the villagers depend on year-round agriculture for their livelihood. The EIA report, the petition states, is silent about the impact of the thermal power plant on local communities, and agricultural productivity. The petition states that the EIA and clearance process have also failed to adequately analyse other impacts of the power plant to do with air pollution, plant emissions, groundwater, and fly ash storage and disposal. A 120-km transmission line to transport the power from the plant to Bangladesh, which will cut through forest land. A 45-km railway line to transport the coal for the plant from the existing rail network. A 10-km road from the railway line to the plant to transport the coal. Villagers, speaking to IndiaSpend this month, alleged that the plant construction underway since last year was already sucking up groundwater in the area, and their water bodies were running dry. IndiaSpend made repeated calls on Monday to S Kerketta, Director (Impact Assessment Division) in the Environment Ministry but he was unavailable for comment.